There are a couple of regrets about this Shanghai Business Trip -all related to food. We were grounded in a remote albeit beautiful hotel situated 1 hour away from downtown Shanghai. Meetings generally started at 8:45am in the morning and ran until 5:30- 6pm. The hotel's F&B capability was utterly disappointing. Buffet lunch spread was exactly the same everyday and the food did not taste good. The only Chinese restaurant in the vicinity served a mix of Spicy Sichuan food and Shanghainese cuisine but again it was just sub-standard stuff. I could tell that we were in for a disappointment when the Xiaolongbao (shanghainese dumplings) had a pastry skin that was thick and tough and that the Crab Roe Tofu (蟹粉豆腐) had a fishy stench. On the one rare evening when I took my customer out to town for dinner, I had looked forward to revisit Justin Quek's creative French restaurant at Xintiandi. Justin Quek, for those who are not familiar is a Singaporean chef who struck out on his own after working at Les Amis. He opened his very first French restuarant in Taipei and was amazingly successful. He then went on to open some 3-4 restaurants at Shanghai's XinTianDi , a cluster of old Shanghainese style residencial buildings,石库门 (like the brownstones in New York) which has been preserved and converted to restaurants and bars. This is where foreigners come to find a slice of old Shanghai and Shanghainese go to connect with the Western world. I still remember my first visit to Quek's highly recommended La Platane restuarant, 梧桐 at Xintiandi. I had the Xiaolongbao with Foie Gras which was just amazing. This time,as I led my customer through Xintiandi, I noticed something was wrong.Quek's bistro at the main restaurant aisle was missing and when I finally got to the site where La Platane used to sit,we saw that it had been replaced by a Spanish Restaurant. Needless to say, I was extremely disappointed. 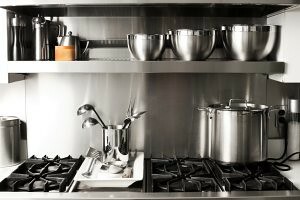 I was really suprised because I had thought it was a really successful and popular restaurant. Then, something spooky happened the next morning, my customer showed me a news article on his Iphone - Justin Quek apparently just got sentenced to jail and fined in Singapore for drunk driving. So by the end of the 'food deprived' week, I became too weary to do anymore food hunting. After my last appointment in Nanjing, I checked into a hotel that was closer to the shanghai airport and it was when I was strolling in the food court next door that a stall selling Laksa Curry caught my eye. Calling themselves LaksaCurry, they were selling various dishes served with the Laksa gravy. Laksa apparently, has really become well received in Shanghai - the eatery stall at the Singapore World Expo Pavillion was selling among other things, Laksa, Kueh Pai Ti and Satay. Business was brisk at LaksaCurry but one look at the gravy, I knew it would not be spectacular. Still, it was an irrestible option for me at that point. Their best selling item was apparently the Laksa Curry Rice served with Fish Cake (叻沙加哩鱼饼泡饭). We normally take Laksa with vermecilli noodles and I have also eaten laksa served with Rice Drops (Mi Tai Mak/ Louxu Fan老鼠粉). It has never occurred to me to eat Laksa gravy with rice... and I was fairly intrigued. As I tucked into the bowl of Laksa rice, I was strangely satisfied. The gravy, as I had suspected was not spectacular, it was watered down and not as fragrant as what we would have in Singapore. However, the familiar and comforting spiciness was exactly what I needed after a week of sub-par Xiaolong Bao, Giant Meat Ball (狮子头) and Crab Roe Tofu. Intent on recreating this with a more authentic Laksa Curry gravy, I decided that this would be the first thing to cook when I get back. For those who are too lazy to prepare the Laksa paste from scratch, there are many ready made paste in the supermarket but I have always been partial to Prima Taste's products. They are my crave saviour when I was stationed in China a few years ago. Bean sprouts As you like. Blanched in boiling water. Quails Eggs Hard boiled. Peeled. 1. Soak dried chillie in warm water until softened. Blend all ingredients in Laksa Paste except coriander powder in a blender. Add coriander powder last. 2. In a heated wok, add chillie oil and fry (1) until fragrant. Add pounded dried shrimps and continue to fry for 2 mins. 3. Increase heat and add coconut milk and water. Continue to stir. Add Tofu Puff and cooked scallops. 4. In another wok heat a little oil and add 2 cloves of garlic. Fry cooked rice until fragrant. 5. Dish fried rice into a bowl. Add Laksa gravy (3) over the rice. 6. Garnish with Laksa leaves, fish cake, quail's egg, bean sprouts and coriander leaf. Serve hot. I have never had laksa curry sauce with rice but laksa curry is definitely on my always to eat but not to cook list..heh...I 'll have it when I go out..if its well done its definitely a fantastic dish. yours looks fantastic witho9ut a doubt. well well so he got caught for drunk driving. what an anti climax isnt it? This is special and you had done it beautifully. I must try to cook this one day. Talking about xiaolongbao, I prefer to have it at some small stalls near 南京东路 in Shanghai. Never had laksa curry before...I am totally intrigued with the picture..my type of comfort food. Tean's Gourmet - I will look for it. Dipping Yau Char Kwai sounds good too! Yay for Prima Taste! I love their Laksa Paste too. Your laksa looks sooo delicious. This is definitely a new way of eating laksa. So Chef Quek actually closed his Shanghai rest to open another one in Marina Sand. 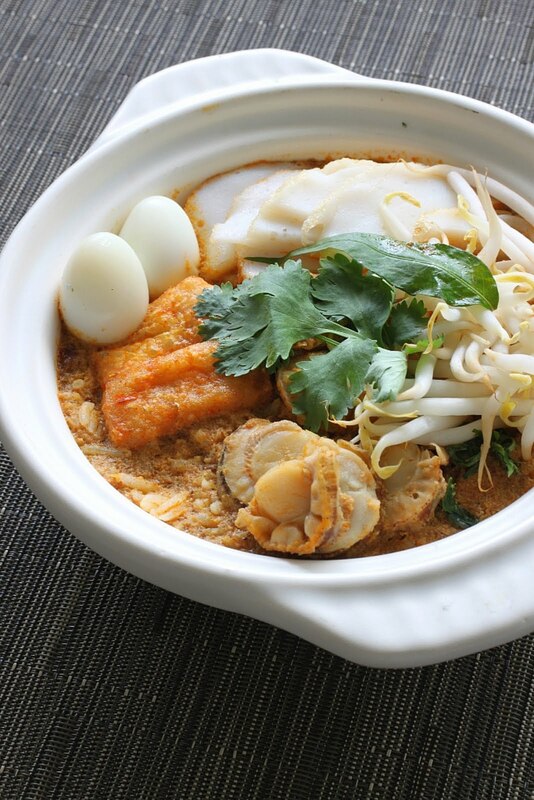 Your laksa looks great, with those dainty quail eggs and neatly cut fishcake and taupok. Glad you finally got your fix before your trip ended. There's a Prima Taste Cafe not too far from where I live. I've enjoyed many a wonderful lunch there. And you're right -- their sauces are always fabulous. 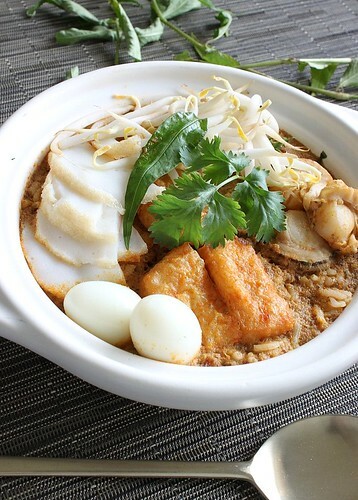 Shirley, this is my 1st time hearing laksa rice, so interesting. Your laksa looks so yummy, I am craving for it now as laksa is my all time favourite! Must be quite tasty! Suddenly it reminds me of Japanese curry rice...and this may be the next Singapore Curry (laksa) Rice after Scissor Cut Curry Rice, maybe? I never had curry with rice like this before, but I prefer to have curry with noodles.Anyway, your bowl of curry rice, look so delicious. Oh, this is REALLY intriguing ... Sorta reminded me of eating my chicken curry gravy on rice ... Sometimes, when I　come to think of it, how interestingly different approach a cuisine can take when it's introduced to another wholly different culture. Just like the Indian food in China. Man, remembering my Chinese friends describing what they have back home, it sounded not-so Indian to me ... sort of toned down. Haha! What a great idea! I love my rice drowned in yummy sauce. This sounds awesome! 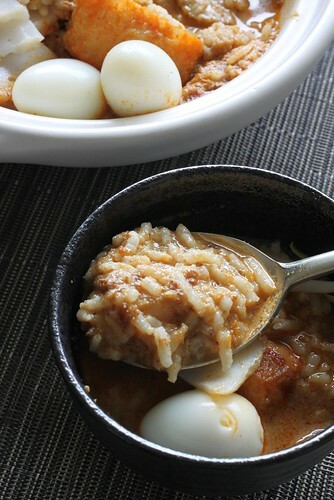 There is something very comforting about laksa sauce with rice. i will certainly try your laksa recipe! Love the idea serving it with mi tai ma too. Oooh...I love curry laksa but have never had it with rice...usually with noodles or bi hoon. 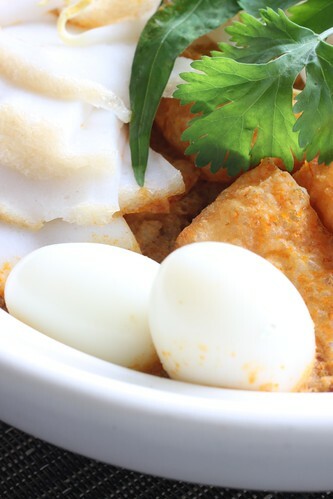 Your laksa looks very delicious. I have to try next time. This laksa looks way too good and I am already drooling. I like mine with yellow noodles though .. very M'sian style. And yes Prima is good and so is Tean's. I believe Tean has a prawn noodle paste as well which is equally good. so many new twists to traditional food these days, but no doubt interesting to know. sounds and looks so appetizing! Belachan are? I never heard about them! This looks just fantastic! Because it's so original I was hoping you might want to share this recipe on my ultimate laksa guide? You can see more here: http://www.squidoo.com/ultimate_laksa_guide it would be a welcome addition to the recipe list. cheers.